O.co Coliseum is the site of the matchup between the Atlanta Braves and the Oakland Athletics on Friday, June 30, 2017. The probable starting pitchers are Mike Foltynewicz for the Braves and Sonny Gray for the Athletics. Atlanta opens at +125 while Oakland opens at -135. The Braves have a 41-33-3 over/under record and a 40-37-0 run line mark. The Athletics are 40-38-0 against the run line and have a 44-32-2 over/under record. The Braves have a 37-40 overall record this season. Starting pitcher Mike Foltynewicz has a 5-5 record with an earned run average of 4.10 and a WHIP of 1.42. He has 68 strikeouts over his 79 innings pitched and he's given up 86 hits. He allows 9.8 hits per 9 innings and he has a FIP of 4.7. The bullpen has an earned run average of 4.06 and they have given up 223 base hits on the year. Teams are hitting .232 against the bullpen and they've struck out 232 hitters and walked 97 batters. As a team, Atlanta allows 8.9 hits per nine innings while striking out 7.1 batters per nine innings. They are 20th in the league in team earned run average at 4.54. The Braves pitchers collectively have given up 677 base hits and 345 earned runs. They have allowed 102 home runs this season, ranking them 9th in the league. Atlanta as a pitching staff has walked 253 batters and struck out 540. They have walked 3.3 men per 9 innings while striking out 7.1 per 9. They have a team WHIP of 1.36 and their FIP as a unit is 4.74. As a team Atlanta is hitting .268, good for 5th in the league. 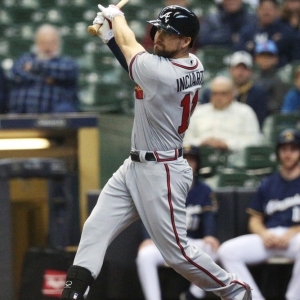 The Braves hold a .415 team slugging percentage and an on-base percentage of .331, which is good for 9th in baseball. They rank 4th in MLB with 9.3 hits per game. Ender Inciarte is hitting .310 with an on-base percentage of .358. He has 100 hits this season in 323 at bats with 31 runs batted in. He has a slugging percentage of .409 and an OPS+ of 102. Nick Markakis is hitting .292 this year and he has an on-base percentage of .368. He has totaled 85 hits and he has driven in 42 men in 291 at bats. His OPS+ is 100 while his slugging percentage is at .388. The Braves have 706 hits, including 133 doubles and 79 home runs. Atlanta has walked 220 times so far this season and they have struck out 564 times as a unit. They have left 529 men on base and have a team OPS of .746. They score 4.67 runs per contest and have scored a total of 355 runs this year. Oakland has a 35-43 overall mark this year. With an earned run average of 4.45, Sonny Gray has a 3-3 record and a 1.35 WHIP. He has 65 strikeouts over the 64.2 innings he's pitched. He's also given up 65 hits. He allows 9 hits per nine innings and his FIP stands at 3.6. The bullpen has an earned run average of 4.92 and they have given up 262 base hits on the year. Teams are hitting .252 against the Athletics bullpen. Their relievers have struck out 253 batters and walked 96 opposing hitters. As a team, Oakland allows 8.9 hits per nine innings while striking out 8.2 batters per nine innings. They are 24th in the league in team earned run average at 4.75. The Athletics pitchers as a team have surrendered 668 base knocks and 357 earned runs this season. They have given up 94 home runs this year, which ranks 16th in Major League Baseball. Oakland as a staff has walked 244 hitters and struck out 614 batters. They give up a walk 3.2 times per 9 innings while they strike out 8.2 per 9. Their team WHIP is 1.35 while their FIP as a staff is 4.36. As a team, they are batting .243, good for 24th in the league. The Athletics hold a .431 team slugging percentage and an on-base percentage of .313, which is good for 25th in baseball. They rank 27th in MLB with 8.2 hits per contest. Jed Lowrie comes into this matchup batting .285 with an OBP of .356. He has 78 hits this year along with 26 RBI in 274 AB's. He maintains a slugging percentage of .478 with an OPS+ of 127. Yonder Alonso is hitting .288 this season and he has an OBP of .383. He has collected 63 hits in 219 at bats while driving in 38 runs. He has an OPS+ of 160 and a slugging percentage of .580. The Athletics as a unit have 630 base hits, including 148 doubles and 108 homers. Oakland has walked 250 times this year and they have struck out on 719 occasions. They have had 504 men left on base and have an OPS of .743. They have scored 4.38 runs per game and totaled 337 runs this season. Who will win tonight's Braves/Athletics MLB game against the spread?